A few months ago, the Snapshots team attended a one-day workshop on “islands in history” at the University of Leicester. The range of viewpoints and methodologies on display was slightly dizzying, but we came away with some fairy niggling questions: how do islands function as spaces in global history? In what does their ‘islandness’ consist, within the wider webs of empire, colony, state, trade and culture? How can we pursue a history and historiography of the global through such tightly bounded, but often richly connected spaces? How do we parse that boundedness, and that connectedness, and to what extent are they related? One of the challenges of an island historiography, we found, is that they’re strangely overdetermined places: we tend to want to make them bear freights of meaning and signification beyond what we might expect of other spaces, loading them down with narrative, resonance and symbolic importance. Recent pictures from the South China Sea, where China is converting semi-submerged reefs and atolls into military installations, make small islands’ importance in global history palpable. The jostling between regional powers over the Spratly Islands, involving both military installations and ambitious reinterpretations of the law of the sea and its bearing on zones of influence, underscores one of the most crudely instrumental uses to which islands tend to be put, as points from which to dominate space through the projection of brute force and legal convention. But it’s worth thinking about the other functions islands fulfil, not only in concrete terms but at the same time in what we might call the political imaginary. Islands figure as spaces of quarantine and incarceration (think of Napoleon on St Helena, Sakhalin, Solovetsky and the prison islands of Australia; think, more recently, of Nauru and Christmas Island); places of refuge, exile, isolation and visions (think Gauguin and Melville in the Pacific, The Tempest, Robinson Crusoe); places of religious incubation, monasticism and prayer (the history of Celtic Christianity, for example, is intimately bound up with island spaces); outposts of the military state, useful for defining spheres of influence, for surveillance and for the projection of force (those troublesome Spratlys again, Diego Garcia, Ascension); and as the poisoned, blasted testing-grounds of technological apocalypse (think Gruinard Island, Bikini, Enewetak and Moruroa Atolls, Novaya Zemlya and the Montebello Islands). In the political imaginary, they figure as rather different spaces: as mirrors which reflect and critique ‘mainland’ societies, and as microcosms in which societies’ alternative dispensations or possible futures, bright or catastrophic, might be acted out. Hence More’s Utopia and the satires of Gulliver’s Travels, the Edens and dystopias of Robinson Crusoe, Swiss Family Robinson and Lord of the Flies. Considering it has no place on any map, The Tempest’s enchanted isle must be some of the most contested real estate in the history of colony and postcolony. Islands serve as elegiac symbols for the erasure of localist specificity by modernity (St Kilda, the drowning atolls of Micronesia) and as monitory narratives of ecological catastrophe and societal collapse (the destruction of the Dodo on Mauritius, the deforestation of Easter Island). These fables, like all the rest, often don’t hold up to scrutiny: St Kilda seems to have been less fun to inhabit than the romantic imagination suggests, and the collapse of society on Easter Island may have owed as much to global climate as to local failures. But island tales are often written disproportionately large. How we might integrate an awareness of this complex history into our work at Snapshots of Empire is an open-ended question. In a recent blog, Kate Boehme read the Colonial Office records of St Helena, situating the island within global networks of power and communication and exploring how its governance during the global crisis of 1857 owed to a complex series of policy calculations encompassing contexts both local and global. In Kate’s work on St Helena, it’s possible to approach an idea of islands as hybrid spaces, both remote and intimately networked; and as places where policy and infrastructure, however small a scale they’re played out on, interrelate with those of other colonies, and the empire at large, in interesting and complex ways. That tension between islands’ remoteness and the efforts to bring them within the networks of imperial power – and the strategies and technologies by which that move might be effected, and indeed the question of whether it’s worth doing at all – is something which comes up quite dramatically in two island stories from the Colonial Office records surrounding our current ‘snapshot’ of 1879. Both involve islands whose extreme isolation renders them as marginal as it’s possible to be on the imperial map; both concern the question of possession and sovereignty; and both come back, essentially, to inter-imperial competition, and the ways in which, by this point in the late nineteenth century, the progressive parcelling-out of the world between rival empires was reaching its endgame. The islands are Pitcairn and Wrangel. Pitcairn Island, smack bang in the middle of the South Pacific, is famous as the place where the surviving Bounty mutineers settled; Wrangel Island, a tract of tundra and mountain off Russia’s Arctic coast, is primarily known now as the last place where woolly mammoths are known to have survived, as recently as 4,000 years ago. In Pitcairn’s case, the primary question was how to integrate this staggeringly remote and tiny community with the empire at large, and how to control and manage its population. In Wrangel’s case, it was whether Britain should care at all. The outcomes were as different as the islands. But in following through how the encounter between place and governmentality played out in the bureaucratic world of the imperial centre, and situating the islands within the cultural life and the political and geographical imaginaries of the time, we might be able to look towards a fuller appreciation of how such places can be read as constituting the ragged boundaries of empire: places where political authority and geographical knowledge stretch and fray, where the usual policymaking process is of doubtful utility and the lines of communication fragile. In December 1878, the Colonial Office received a despatch from the Admiralty, enclosing a letter from Rear-Admiral A.F.R. de Horsey, C-in-C of the Pacific Station of the Royal Navy. Horsey’s letter, written aboard his ship Shah on September the 17th of the year before – meaning that it had taken over a year to get into the hands of the CO – reports that, en route from Esquimault (the naval station near modern-day Vancouver) to Valparaiso in Chile, he had called at Pitcairn Island. His account takes up 16 numbered paragraphs, and touches on the current population, the system of government and the social and economic arrangements of the island. He appends a census of the 91 inhabitants and a brief table of its laws. The almost puerile simplicity of the laws is perhaps the best evidence of the good conduct of the people. The law is, in fact, merely preventive, no case of theft, fornication, or use of profane language (apparently the only three crimes contemplated as possible) having been known to occur since the laws were drawn up. Divine service is held every Sunday at 10.30 a.m., and at 3 p.m., in the house built and used by John Adams for that purpose until he died in 1829. It is conducted strictly in accordance with the liturgy of the Church of England, by Mr Simon Young, their selected pastor, who is much respected. A Bible class is held every Wednesday, when all who conveniently can attend. There is also a general meeting for prayer on the first Friday in every month. Family prayers are said in every house the first thing in the morning and the last thing in the evening, and no food is partaken of without asking God’s blessing before and afterwards. … The observance of Sunday is very strict; no work is done; but this is not in any pharisaical spirit… Of these islanders’ religious attributes no one can speak without deep respect. A people whose greatest pleasure and privilege is to commune in prayer with their God, and to join in hymns of praise, and who are, moreover, cheerful, diligent, and probably freer from vice than any other community, need no priest among them. The instruction [in the schoolhouse] comprises reading, writing, arithmetic, Scripture, history, and geography. The girls learn sewing and hat-making as well, and the whole are taught part-singing very effectively. Every child and unmarried woman at present has to attend school from nine to twelve and from one to three p.m.
…No alcoholic liquors, except for medical purposes, are used, and a drunkard is unknown. The houses are well ventilated, and furnished sufficiently for their simple wants. Scarcely any trees good for timber grow here. There is no money on the island, except such few coins as may be kept as curiosities. These islanders might be innocent in spirit, but their bodies and intellects are disciplined according to the gendered practices of nineteenth-century elementary education. If they experience poverty – and it is clear that they do, in resources and in capital – it is a poverty that is construed as essentially benign. The silent point of reference here, perhaps, is the urban proletariat of the late Victorian imagination. Weakened and dehumanized by drink, unventilated dwellings, and a lack of correspondence between their material environments and bodily wants (dwellings without furniture, money without value, food that was not food), the industrial working class were conceived of as both an internal threat and a moral stain on British civilization. If anything represented the radical mobility of bodies, values, culture and ethics under industrial capitalism, it was them. Pitcairn, of course, presents a society in which rootedness and stability (albeit, in fact, fragile, and enforced by a vertiginous isolation) combine with virtue to stand outside of troubling historical processes. To advert to colonized or exotic cultures for a comforting antidote to the anxieties of modernity was as common a move in the late nineteenth century as it is now; in Horsey’s account, the sense of relief at having found this pre-lapsarian Little England is almost palpable. Captain Beechey, writing fifty-three years ago, says ‘these excellent people appear to live together in perfect harmony and contentment, to be virtuous, religious, cheerful, and hospitable; to be patterns of conjugal and parental affection, and to have very few vices.’ I have ventured to quote these words as they hold true to this day, the children having followed in the footsteps of their parents. Finally, I submit to your lordships that when the service will admit it is desirable that a ship of war should visit Pitcairn annually, and I propose to cause this to be done during the remainder of my command. I submit also that this small colony is deserving such attention and encouragement as Her Majesty’s Government may think fit to hold out to it. Her Majesty does not, I believe, possess in any part of the world more loyal and affectionate subjects than this little knot of settlers. I may here observe that a notion appears to prevail among the Pitcairn Islanders that Her Majesty’s Government are displeased with them for having returned from Norfolk Island (which, as their lordships are aware, they did in two parties, the first in 1850, and the rest, I think, in 1864), although their return was, I believe, at their own expense, and they have since been no burden to the Grown. This notion, whence received I know not, I ventured to affirm was without foundation, feeling assured that Her Majesty’s Government would rather honor them for preferring the primitive simplicity of their native island to either the dissolute manners of Otaheite or even the more civilised but less pure and simple ways of Norfolk Island. No one acquainted with these islanders could fail to respect them. A religious, industrious, happy, and contented people, they will lose rather than gain by contact with other communities. What’s striking here is that Horsey prescribes a closer absorption into the remote constitutional and technological network of empire as a prophylactic against the pollutions of the informal, transimperial and unpoliced networks that are closer to hand. 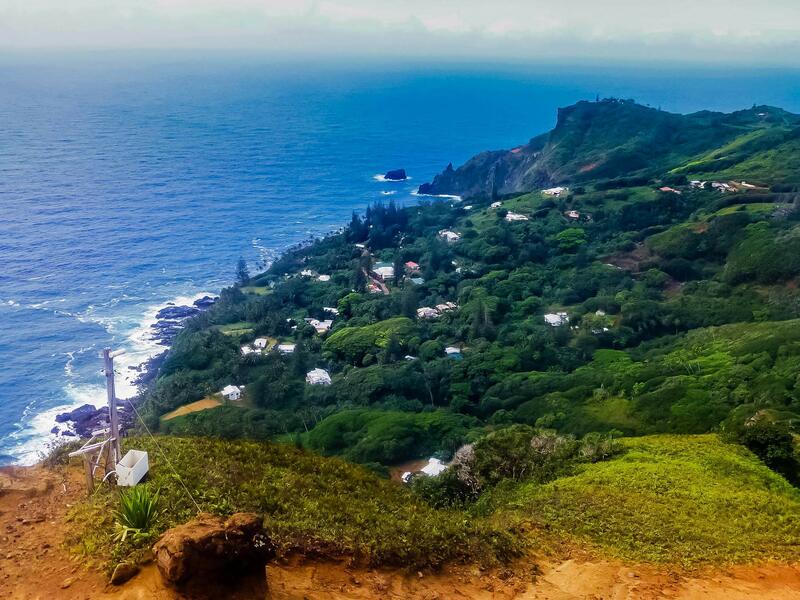 Pitcairn is to be preserved as a pious, endogenous, English-speaking micro-polity, in all its “puerile simplicity”, by yearly visits of a warship and the formal imposition of English sovereign law. This is also, implicitly, an inter-imperial issue. Horsey notes tersely that “One stranger, an American, has settled on the island, a doubtful acquisition.” The man is listed in the census as Peter John Butler, 26 years old, born in Brooklyn. He arrived on the island as one of the crew of the British ship Khandish when she was wrecked on Oeno, an atoll about 100 miles away. The crew spent six weeks on Pitcairn awaiting pickup, and Butler afterwards returned to marry an island woman who had recently been widowed: the census records them living with newborn female twins and an older daughter from his wife’s first marriage. The arrival of the American might have been unsettling, at least in part, because America was the current rival expansionist naval power in the Pacific. The CO may have been aware that the stay of the Khandish’s American sailors on Pitcairn had occasioned ongoing cultural links with San Francisco, and the prospect of a rival English-speaking power having more traffic with the islanders than Britain, however informal, must have left a sour taste. They would also have been aware of what happened the last time an American citizen set up on Pitcairn. Joshua Hill, an adventurer and fantasist with US citizenship, had landed on Pitcairn in 1831 and spent the next seven years establishing an almost dictatorial power over the island, appointing himself President of a Pitcairn Commonwealth and giving long denunciatory sermons with a gun under his chair. Several prominent islanders fled before Hill was deposed by a visiting RN Captain and sent to London, where he continued to petition the CO and other government branches for compensation for his services. All these anxieties – the foreign presence, the constitutional issue, the threat of America in the Pacific – are evident in the minutes that Horsey’s dispatch collects as it moves through the Colonial Office. It’s worth outlining how this worked. On arrival at the CO, despatches would be provided with a printed cover-sheet, which performed several functions. First, it functioned as a form for the office to classify the despatch, assigning it a number, noting which despatches it related to, and summarising its origin and subject matter. Secondly, it recorded the despatch’s movement through the CO’s bureaucracy, as it passed over various employees’ desks. The string of minutes, usually a paragraph or two long, that accumulate on the minute sheer represent the input of the secretaries, undersecretaries, assistant undersecretaries and chief clerks who, sometimes in an orderly line of precedence and sometimes in something rather more like a back-and-forth colloquy, decided how to respond. Each intervention would be marked with the initials of the contributor; and while for many despatches it seems obvious that the real work of policymaking went on in exchanges now unrecapturable, or is recorded in more dispersed and complex paper-trails, it’s still possible in the minute-sheets of the CO records to see the distribution of roles, the sharing of expertise and the negotiation of authority between a small cast of officials. It’s possible, too, to see how these documents were read by their first recipients: what struck them as significant, what they thought inadequate, what was seen as requiring urgent attention and what wasn’t. The impression, often, is one of workaday intimacy. See memorandum by Mr Bussell (February) and annexed respecting Pitcairn Island – it would I presume be held to belong to the British crown if any Foreign Govt attempted to take possession of it. I was wondering yesterday when I passed 15553 how the magistrate managed to enforce the rules for the maintenance of order especially as an outsider in the shape of an American has managed to locate himself on the Island – You will best know whether the authorization sought can be given. John Bramston was an assistant undersecretary who specialised in dealing with despatches from Canada, South Africa, Australian and Pacific colonies. By the time this one reaches him it has already accumulated a book (Pitcairn: The Island, the People, and the Pastor, by the Rev. Thomas Boyles Murray – an 1854 publication of the Society for Promoting Christian Knowledge, of which Boyles Murray was then secretary), and an earlier memorandum from February 1878. Bramston replies by recirculating the despatch with the further addition of a set of minutes from a Cape Colony Despatch (No. 15253) relating to the constitutional arrangements of Tristan Da Cunha. This paper raises the question which was much considered here in 1876 on whether an Island circumstanced as this Island & Tristan Da Cunha are should not have some recognized civil & executive power, vested by a simple & rudimentary form of commission in the person who without any authority now acts as chief magistrate in a British Territory. Lord Carnarvon did not see his way to proceeding in the case of Tristan D’Acunha in the manner proposed: and although it is not altogether satisfactory to formally invest with executive & judicial powers an ignorant man selected by an ignorant community, it is of course also unsatisfactory to have an entire absence of legal authority on British soil. If you think it would be well to take up this question the proposals made for Tristan d’Acunha in 1876 can be recast with the alterations then suggested by Law Officers. Having been combined with the relevant documents – in this case a cross-reference with a similar constitutional puzzle from a far distant context – and endorsed (that “C Dec 21”) by George Cadogan, Earl Cadogan (1840-1915), the Parliamentary Undersecretary, the problem is now ready to be sent up the chain of command. I think I should let this alone until we have clear proof of the necessity for our interference with a little community that has hitherto managed its own affairs. In such a place they do not want our complicated system of law – their own few simple rules can easily be enforced by themselves. It is, no doubt, an anomalous state of things: but I think less objectionable than one in which we should invest with authority a person not appointed by us; and over whom, as well as over the laws administered by him, we should have no control whatever. And there the matter lies. As so often in colonial administration, the question that reaches London turns out to be a question that London resolves simply to bear in mind. The matter demands no immediate response; there is no particular inclination to adopt an active policy, or no resources to hand with which to enforce it; things are best left to colonial governors on the spot, trusting to their judgment and closer understanding; any or all of these reasons might be in play. So, for the time being, the issue of Pitcairn – whether it is to be visited yearly, what its legal and constitutional arrangements are to be, and indeed whether it is to be formally pronounced British territory except purely negatively, in the face of an immediate counter-claim – was left in abeyance. A pragmatic reluctance to tinker, and a sense of the problem’s relatively nugatory scale, won out. But the imaginative pull of islands, Pitcairn’s uniqueness and susceptibility to mythologization, and the vividness of Horsey’s narrative were to ensure that his despatch enjoyed a cultural afterlife outside the Colonial Office. 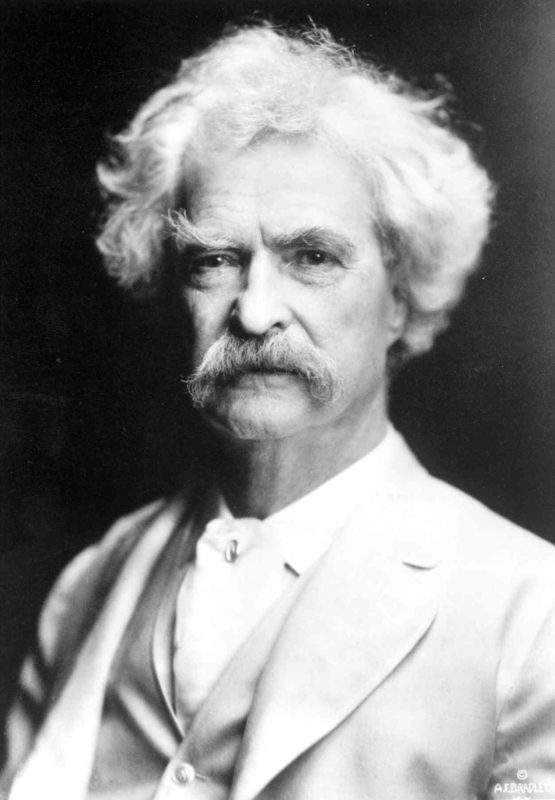 Horsey’s report also came to the attention of Mark Twain (yes, the Mark Twain), who was travelling in Europe at the time. Twain quickly turned it into a short story, The Great Revolution in Pitcairn, which draws on the Joshua Hill story while quoting large chunks of the report, picking up in particular on the “puerile simplicity” and the emphasis on piety. In Twain’s piece, John Butler becomes Butterworth Stavely, essentially an amplified version of Hill. Stavely, an adventurer whose arrival on Pitcairn is as abrupt and inexplicable as Hill’s was in reality, uses a dispute about a chicken – and the islanders’ mistake of keeping all their laws in a poorly-guarded strongbox – to manufacture a constitutional crisis. Whipping up anti-imperial fervour against Britain, he inveigles his way to being crowned Emperor of the Pitcairn Commonwealth, embarking on a Napoleonic career of petty tyranny and comic self-aggrandizement that inevitably sinks under the weight of its own contradictions. Twain’s story uses the time-honoured trope of the islands as political microcosm both to take aim at some fairly obvious satirical targets (the performativity of power, the fiction of the state, the credulity of citizens) and to generate an extended series of comic setpieces based on the spectacle of a village society as small as Pitcairn’s attempting to fulfil the functions of an imperial state. But the fable maintains a careful ambivalence about empire, and doesn’t essentially contradict Horsey’s view of Pitcairn as a society whose innocence and integrity is best guaranteed by benign, if distant, British rule. Where there is an anti-authoritarian sting in the tail of the story, it is directed at the islanders’ much-vaunted piety rather than any structure of state power. As a political parable, its commitments are queerly unpolitical. 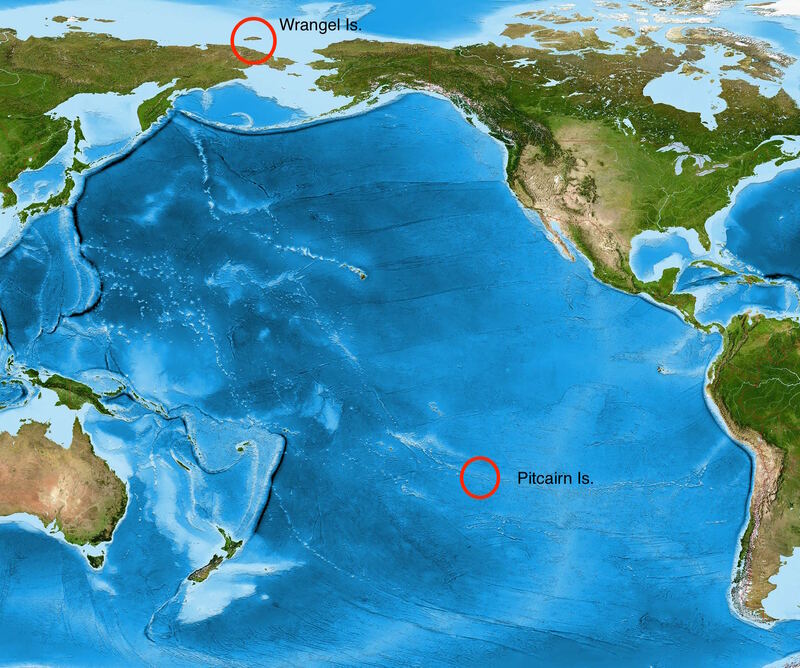 The story of Wrangel Island is very different from that of Pitcairn. 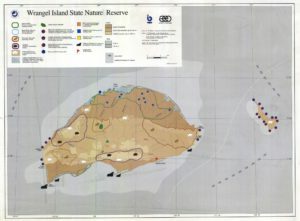 Essentially, nothing much happens: a claim has been made to the Island by the USA; the CO consider whether they might have any pre-existing claim to the island on behalf of the British Empire; they quite sensibly decide that they have little interest in who makes claims to islands which are uninhabitable, more or less inaccessible, and far from any area in which they have much interest in projecting naval power. But if nothing else, the bureaucratic encounter with Wrangel provides a counterpoint to that with Pitcairn. In both cases, the same cast of CO staff faced issues of territoriality, sovereignty, remoteness and geostrategy, and come up with very different answers; in both cases, the encounter takes place in a larger cultural context in which remoteness itself, and how it is construed, is central to how those issues are thought about. Briefly, in August 1881, a party from the US Revenue Cutter Corwin arrived at Wrangel Island. Naming it ‘New Columbia’, they claimed it for the USA. Neither the name nor the territorial claim would stick. Nonetheless, the US government notified the British, and towards the end of November the Admiralty informed the Colonial Office of what had transpired. The despatch they sent contained the Admiralty’s own briefing on Wrangel, and an updated chart of the island and its immediate neighbourhood. To briefing gives a strong impression of the piecemeal way that the topography and geopolitical dispensations of the Arctic came into focus. The first intimation to geographers of the land now known as Wrangell Land, was on the authority of the Russian Explorer, Baron von Wrangell, who in 1823, while exploring the Arctic shores of Eastern Siberia, was told by a Native chief, that on a clear summer’s day, snow covered mountains were observed (to the north) from Cape Jakan, a head land in long: 177 E.
In August 1849 Captain Kellett in HMS Herald being then engaged – by way of Behring Strait – in the search for Sir John Franklin’s expedition discovered a lofty and almost inaccessible island in lat: 71.20 N – long 175.30 W. (the Herald island of the Charts). At the same time, beyond this Island to the West and North and extensive high land was seen. This new land, which was not very far distant from the mountainous region recorded by Wrangell, as seen from Cape Jaken, received the name of Kellett’s Land. In August 1867 – the season being very favourable, some American whaling ships gained the neighbourhood of these lands – one of the Captains (Long, of the ship Nile), traced continuous land from 70.46 N and 178.30 E running Eastward to 178.51 W.
He considered it impossible to tell how far the land from the last position (Cape Hawaii) extended northwards, as ranges of mountains extended as far as the eye could see; but that he had learnt from another Whaling Captain (Blevin, of the ship Nautilus) that he (Blevin) saw land NW of Herald island, as far North as Latitude 72. 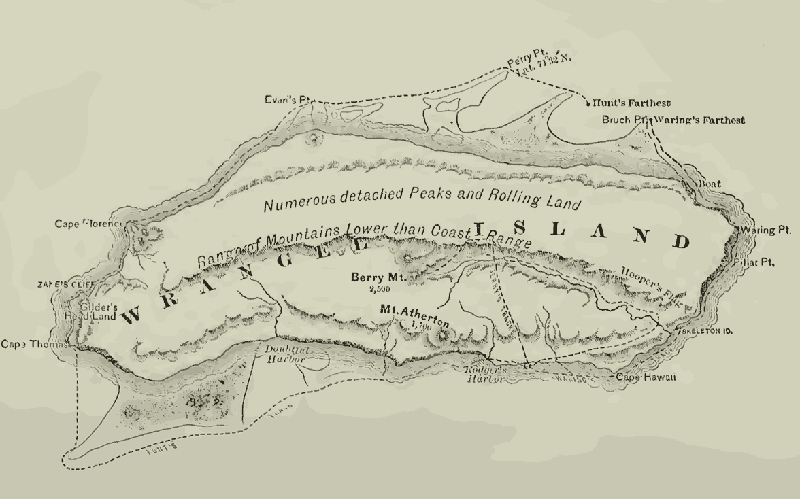 Captain Long named the land he had traced (it appears he never got closer to it than 15 miles) ‘Wrangell Land’ as an appropriate tribute to the memory of the Russian Explorer. 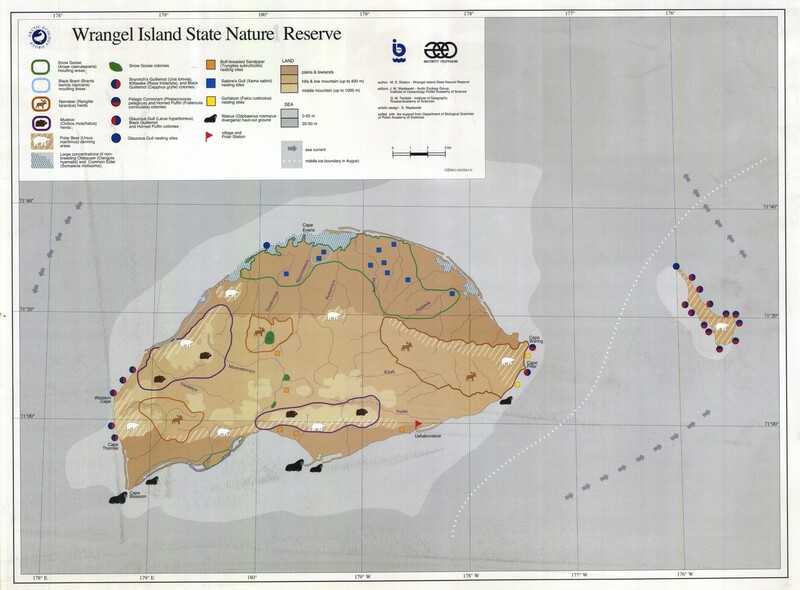 The Charts thus show two names for what apparently is one continuous land, or group of large islands, Wrangell Land and Kellett Land. Kellett and Blevin’s original observations are largely accurate, although they tend to slightly overestimate Wrangel’s extent; this passage sets out rather elegantly both how the new land was boxed in – fixed within bounds of latitude and longitude – and how knowledge of what was within those bounds was kept carefully provisional until further evidence was given. It also gives a nice sense of how the business of Arctic exploration and mapping proceeded. Unlike the Antarctic, whose unique isolation and inaccessibility were met at the end of the century with a combination of technology, political will and ideological fervour which sparked the relatively short heroic age of exploration, geographical knowledge of the Arctic had a long pedigree which encompassed the geographical knowledges of indigenous peoples, the penetration of resource extraction industries – most notably whaling, sealing and fur trading – and a rather longer history of European exploration dating back to Davis, Frobisher and the Muscovy Company. 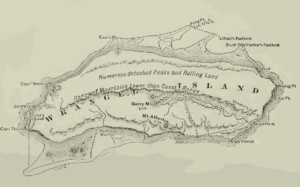 (Above) Sketch chart of Wrangel from Log Book of the USS Rodgers (1881); (below)modern nature reserve map of Wrangel and Herald Islands. Mammoth tusk on Wrangel (courtesy of Wikipedia). In this case, there was no appetite for geostrategic competition: nothing was felt to be at stake; existing technologies and geostrategic dispositions placed Wrangel far from any immediate inter-imperial competition; the only local resources worth having were whale oil and navigational data, both of which were easily collectable in seas in which territorial sovereignty was effectively, at this point, understood to be a fiction. While Pitcairn, the argument goes, can only preserve its technologically and politically undeveloped society from unknown threats (internal and external) through the imposition of hard technology (warships) and the juridical techniques of statehood, neither are yet of any use in the Arctic. Claims to sovereignty could only really be made speculatively, against a future in which the means to back them up, or the circumstances in which they’d be worth asserting, might arise. The new data is to be disseminated to the relevant Colonial governments, where it will lie in wait until it becomes useful; otherwise, the island and its territorial status can be more or less forgotten. 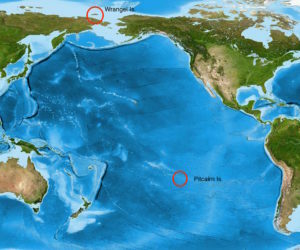 The relative trajectories of Pitcairn and Wrangel, in terms of global history, constitute almost a reversal of the calculations behind the CO’s decisions in 1878 and 1881. Pitcairn, a potential front line of inter-imperial competition and a psychologically important cultural artefact, would perhaps never loom so largely in the administrative or cultural mind again; Wrangel, albeit quietly, has become deeply implicated in new geographies of geostrategy, ecology, and the Anthropocene. Pitcairn continued much as it always had. There were a few experiments in modes of governance – a temporary parliament at the turn of the century saw an attempted separation of judicial and administrative powers, but the system of a unitary executive lodged in the Chief Magistrate was felt to work best. Laws were made to prevent the settling of foreigners, and then relaxed, although incomers were largely quite carefully vetted; the social fabric, always strained by Pitcairn society’s tiny size and extreme isolation, held together, more or less. The island became a formal British Colony in the 1930s. The sexual abuse trials that marred its reputation since 2004have been amply documented elsewhere; as ever, that island overdetermination has been made to work overtime in attempting to draw meaning from the trials, the cultural and ethical conflicts they represented, and how they might be read within the history of colonialism and postcolonialism. It is interesting to note, however, that the same anxieties about sovereignty and legal constitution that worried the CO in 1878 began to manifest during the upheaval. The initial defence argument took the line that, since the island did not fall under British criminal law, the court set up on the island held no jurisdiction; and throughout the trials the legitimacy of the court fell under various kinds of questioning (none of them successful). 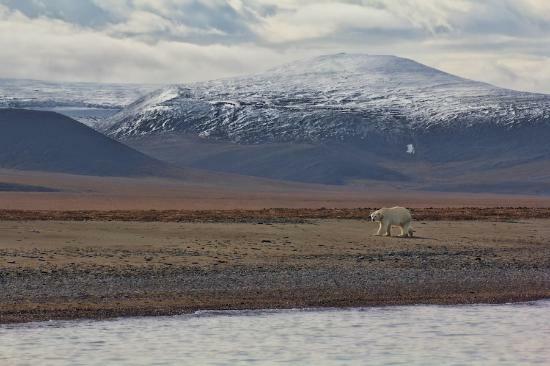 Wrangel Island was formally claimed by the Russians in 1916, with no apparent protest from any other power. The heroic age of Arctic exploration left its usual residue of detritus and graves: a party of stranded explorers from the 1913-16 Canadian Arctic Expedition generated some exceptionally grim stories of starvation, madness and death, and a castaway incident in the 1920s generated considerable interest. But while Pitcairn’s geostrategic importance waned, Wrangel’s rose: as a far-north outpost of the Soviet Union it found itself on the front line of the Cold War balance of terror, and military installations made it important enough to 1950s war planners at the Pentagon to make it a nuclear target. At present it is a nature reserve, inhabited seasonally by Chukchi fishermen and year-round by a small team of conservationists. But as sea ice retreats, the opening up of the Arctic Ocean places Wrangel dead in the middle of what may soon become a major commercial seaway. As the Arctic becomes a space in which concepts of sovereignty and territory are being contested and redefined – with not only its land at stake but its undersea ridges and continental shelves, any stretch of seabed which might yield access to the hydrocarbon reserves beneath – Wrangel finds itself again on the front line between expansionist territorial powers facing off over space, resources, and influence. 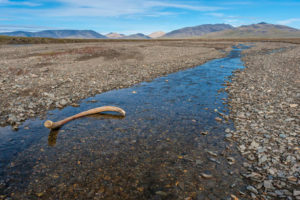 It is also, of course, on the front line of the Anthropocene: as a strategic outpost in the first oceanic region to have both its geopolitics and its ecosystems radically remade by climate change, and as a stretch of tundra whose underlying permafrost contains not only mammoth bones but millions of tonnes of methane, awaiting the thaw. Colonial Office: New South Wales Despatches, National Archives CO 201/585-6. The Spectator (London), December 14, 1878; p. 9. The Englishwoman’s Review (London), December 14, 1878; p. 558; issue LXVIII. Colonial Office Canada Despatches, National Archive CO 42/758. Irving C. Rosse, ‘The First Landing on Wrangel Island, with some Remarks on the Northern Inhabitants’, Journal of the American Geographical Socety of New York, Vol. 15 (1883), pp. 163-214.